An old collapsed barn in front of the peaks of the Teton Range which are hit by the first light of the day in Grand Teton National Park. 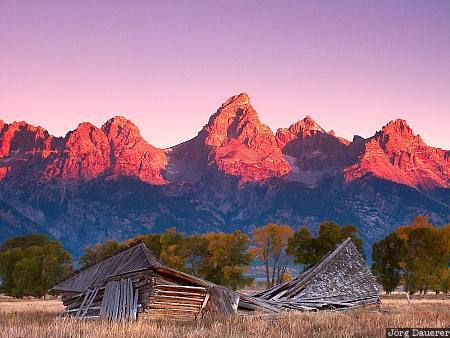 Grand Teton National Park is in eastern Wyoming in the United States. This photo was taken in the early morning of a sunny day in late September of 2003. This photo was the image of the month in November of 2011. This photo was taken with a digital camera.